Wow, time flies by when you have a lot of work! Since Easter my climbing outside has been limited, quite expected since the months of April and May together with September and October are the busiest for a small travel agency like ours. Training on the other hand has gone very well! No finger problems (knock on wood) and feeling strong and energetic most of the time. Trying to get into what here is called “Fisico” and equals to ending each training session with a massive amount of pull-ups, campus, lock-offs, weighted pull-ups etcetera. It has been a challenge and most of the times I’m very happy if I can get through half of it. To last 2½-3 hours of training I try to eat a good meal two ours before going training and have a short siesta, it helps a lot. La Reina de Africa, 7a+, in Camarasa. A lot of people here love Camarasa and now I understand why. It is a very, very good area. La Reina de Africa is a 35 meter long route that is basically a 15 meter long slightly overhanging section at the start and some quite intense moves by the very last bolt. Hard 7a or soft 7a+? Well, I take the 7a+. 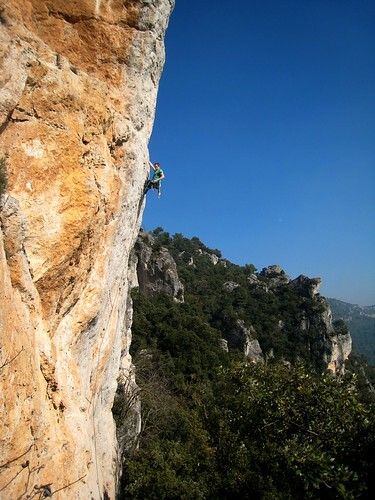 Sr. Pivot, 7a, in Montserrat. I tried this route last year, escaping the hardest moves by going into a rest on the side and then using my massive span to skip the whole section. I couldn’t even hang on two the little two finger pockets at the crux and not hold the slopey crimp after. Coming back again after 8 months of training was great, did the crux moves first try warming up, then sent the route twice completely avoiding the left wall. Cool route and really nice feeling to see the difference from the training! Solo para ella, 7b+, Mont-Ral. Wow. One of my projects for the winter. Did all the moves of the hard start (up to where Fredrik is on the photo above) straight away. Long and hard moves. Heal hook. Some really marginal moves. And long! About 38 meters in total. What a great project! Went back there again to work the route for two more days. 27 C warm. Not a chance, just impossible. But come October I’m back! That about the routes. Now it’s summer here in Spain and I must say that this is the worst time of the year climbing wise for me. I have plenty of time in November to March so I’ll take this following months to train as hard as possible, enjoy the summer and once in a while try to climb outside. My maximum grade drop a lot with the heat, I’m from the north that is clear. So my goal is to be in as good of shape as possible when fall comes. Food and fitness-wise I’m still very happy with my diet. Skipping junk-energy like pasta and sugar and eating a lot more fat has been a great decision. Weight wise I’m more or less stable just around 84-85 kg but with less fat. Let’s see what happens in 6 more months. Well, now time for a rest and then down to train!